SuperVan offers same day and next day expedited services tailored to fit your needs. Whether you are shipping a few boxes that will fit in a cargo van or need a full truckload just give us a call, we can help! SuperVan now offers blanket-wrap service! This unique new service is an excellent way to reduce packaging needs and ensure that your special, delicate or high-value products are received in perfect condition. If you ship medical equipment, store fixtures, industrial equipment, electronics or any other delicate or un-protected products call us! We provide the blankets and straps to do the job right so that you can ship with confidence! The next time your company needs to transport delicate or unprotected products, think SuperVan! 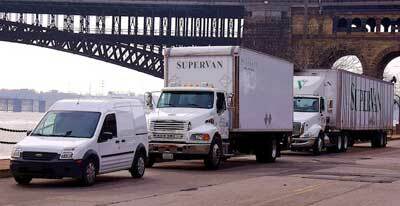 SuperVan can offer a broad range of Dedicated Truck Services that are unique to your individual needs.This service can be used as a compliment to your existing fleet, or can become an effective alternative so that you can focus on your core business and not transportation matters. We are an extension of the companies that we drive for and your shipments are delivered safely and on time by professional drivers with the best equipment and resources available. Call us to develop a plan for you!